Fridge Art Fair is coming! Fridge has teamed up with Miami’s landmark music venue, Churchill’s Pub. Under the supervision of Emcee “Battle Funk,” from 3-6pm daily! Churchill’s will present some of Miami’s hottest and coolest popular performers in the Fair’s Sculpture Garden outside the Beach/Boardwalk entrance. Fridge is celebrating itself and is hosting a pre party after party at Churchill’s Pub in mainland Miami’s Winwood/Little Hati. 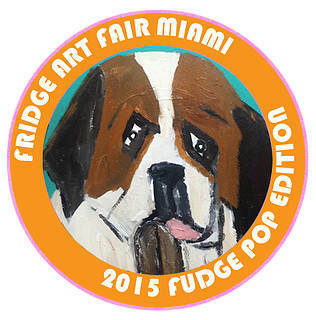 Fridge Art Fair celebrates its self with special Fudge Pop Fridge Suprises! FRIDGE FILM SCREANING AT FRIDGE ART FAIR "CHARMED LIFE"
Honoring our opening gala’s shining hostess Sweetie and her new show “An Evening With Sweetie” we will be screening Pure Content Pictures Documentary “Charmed Life” which focuses on the Sandra Bernhard shows “Sweetie” and her life in Drag. The documentary features some of the biggest names in the Drag world from Mother Sabrina Flawless to the “Scissor Sisters” Ms. Rose. The Film will be screened at one pm Friday Dec 4th at Fridge Art at the Holiday Inn Miami Beach. Moving off-site, Fridge Art Fair presents a Pop Up exhibition “Color Me Happy” in South Beach at our Grand Gala beneficiary, LGBT Welcome Center of Miami Beach located on the ground floor of Miami Beach’s Historic Courthouse. Opening December 2 with the “Grand Fudge Pop Pre Party” hosted by Churchill’s Pub from 7- 10, the show presents colorful, joy-filled works of art by the extended Fridge family of creators from Miami, New York and around the world. Surprise host/DJ is a notorious Miami legend, and we will say no more...Suggested donation is 20 dollars to benefit the LGBT Welcome Center. This exhibit runs through Art Week and is open to all, as is Fridge Art Fair at the Holiday Inn Miami Beach; during the Welcome centers open hours gogaymiami.com. Donations are appreciated and go to the Welcome Centers Mission of continuing beach pride and creating a Miami Beach and world where the LGBT community is treated with respect and dignity and an environment where one is able to love and cherished who they are. We have made a lot of progress but there is still work to be done! We are also pleased to present world renowned musician Matt Sullivan, oboist/composer/improviser, is Director of Double Reed Studies at New York University’s Steinhardt Department of Music and Performing Arts Professions. Well known for his longtime association with New York City’s Downtown music scene, Matt grew up in St Louis, Missouri where he began subbing in the St. Louis Symphony at 17 years of age. In 1972, he moved to Miami to attend the University of Miami. While in Miami he became principal oboist with the Miami Opera, the Ft Lauderdale Symphony, the Miami Beach Symphony and Miami Philharmonic (now the Florida Philharmonic). Moving to NYC in 1978, Matt is lives in Manhattan’s East Village. Matt Sullivan returns to Miami with performances of his own electro- acoustic solo oboe music at Fridge Art Fair Miami Beach. "THE B.A.R.C. PROJECT" ERIC GINSBURG TO BENEFIT B.A.R.C.